If you know where an ancestor lived, parish records, local directories and census returns are good hunting places, and many are now available on CD. 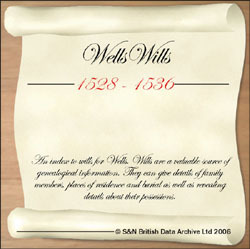 Another good source for family historians is wills, and again more have been put on disc recently. Parish Registers can go back to the 16th century, and are invaluable once you have tracked your family tree back before civil registration was introduced in 1837. 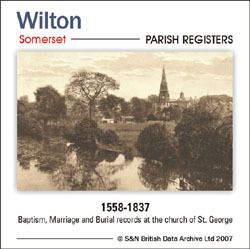 S&N British Data Archive is continually issuing discs containing parish registers from around the country. Among the latest are: Rowley Regis, Staffordshire, 1539-1812 (£17.45); Wilton, Somerset, 1558-1837 (£17.45) and Chesham, Buckinghamshire, 1538-1636 (£17.45). Each contains a published transcript of the relevant registers from books long out of print and, in the case of Rowley Regis, a brief history of the parish. The Wilton transcripts are supplemented by other information related to the parish. 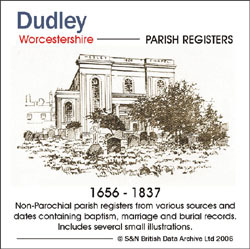 Non-conformist registers feature in Dudley, Worcestershire 1656-1837 (£17.95) including those for the Religious Society of Friends (Quakers), Independents, Wesleyans and Baptists. For a local list of wills, try Wells Wills 1528-1536 (£17.45), which consists of about 600 wills proven in the diocesan probate court. Although the originals are lost, these copies do give summaries of bequests. The wills are arranged by place, and there is a list of particular saints and services associated with different parishes. An elementary knowledge of Latin is needed for some phrases though they are substantially in English. Founded in 1830, University College School in Gower Street, London, prepared boys for higher education in a non-denominational establishment. It later moved to Frognal, near Windsor, and a junior school in Hampstead, North London was set up in 1891. 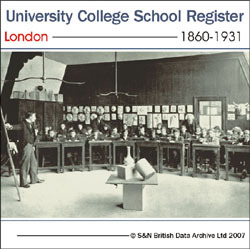 University School Register 1860-1931 (£17.45) contains an alphabetical list of pupils, some with their home addresses, plus staff who taught there, supplemented by a short history of the school, a list of distinguished Old Boys and photographs. Another educational establishment was the less well-known Windlesham School. It was founded by a clergyman who moved, first to Blackheath, South London, then to Newport on the Isle of Wight, taking the school with him. After he retired the school was run by an ex-naval officer who moved it to Brighton. Windlesham House School Register (Muster) 1837-1887 (£17.45) lists pupils in chronological order, giving the names of their parents plus a brief account of their subsequent careers, where this was known, and some addresses. Handwritten addenda give additional details, and the disc is indexed. Anyone who can't find an ancestor - perhaps because the name is misspelled or has been erroneously transcribed - will need to look at the original census documents. Local historians studying, for example, migration patterns and looking to find people born in a particular place, also cannot use the online resource. Such researchers may find it easier to trawl through a disc which concentrates on a particular area. This is the strength of the Staffordshire 1901 Census (£24.95) which gives a place index and even a street index for densely populated areas. Name indexes from some of the earliest surviving census in 1841 are also available. They include the Yorkshire 1841 Census Index and the Lancashire 1841 Census Index at £19.95 each. S&N have compiled a bonanza for anyonbe with Yorkshire ancestors, since it has put on disc indexes to its image sets of censuses for Yorkshire not only from 1841, but also 1851, 1861, 1871, 1891 and 1901. Each contains names, piece and folio numbers and page numbers. Each disc costs £19.95. However the 1881 census, indexed by volunteers for the Church of Latter-day Saints, is already available on the internet and on microfiche. Education, honours and parentage are all laid out in The County Families of the United Kingdom 1880 (£17.45). Interestingly, details of landownership and income are provided even for people who did not bother to reply to Edward Walford, the compiler. There is also an index to the different families' country seats, which may suggest further sources of local records for anyone who finds a family link with the aristocracy or prominent members of the gentry.